It's that time of year again! I will be contacting our seasonal color clients to choose Fall/Spring flowers for installation in October. If I have not contacted you yet, feel free to contact me. Snapdragons, Pansies, Violas, and other green plants will be planted in October. 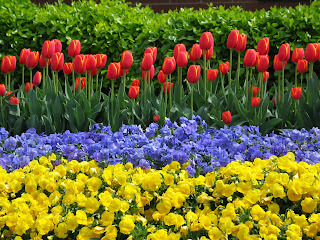 Tulips and other bulbs will be planted in November and December when they arrive from Holland. Color combinations are virtually limitless, so be thinking about what you would like to see this year. See you soon.